It is all a matter of taste. 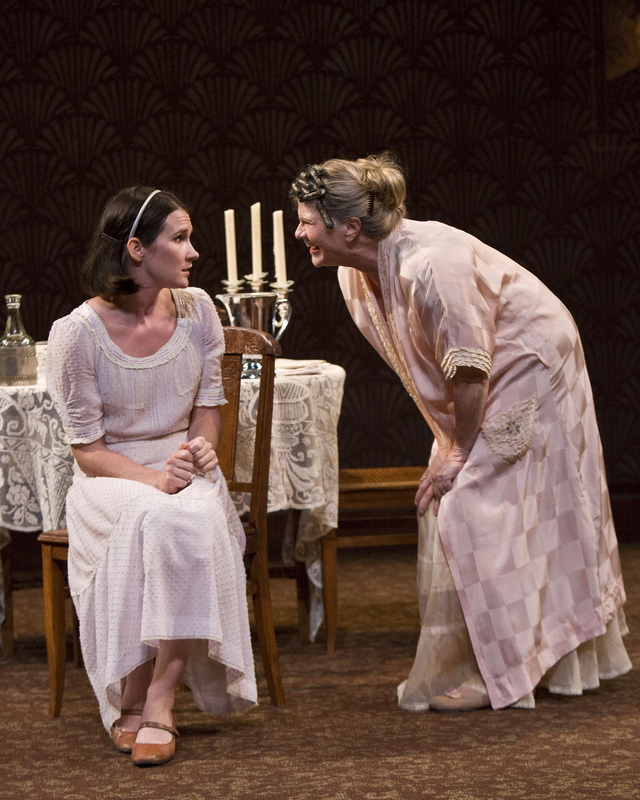 You will either love what has been hailed as a fresh look at “The Glass Menagerie” or you will see Gordon Edelstein’s production of the American classic as sitcom with a whammo ending. I fall into the latter category. Read on if you are curious why. For starters there is the set. I understand that this is a modern production. And I am not opposed to a restaging that breathes new life into a classic (for example Joseph Papp’s practice of restaging of Shakespeare). I like that idea, but there are elements that are costly to ignore. Tennessee Williams’ stage directions, and previous productions I have seen, specifically say that there should be a set of shelves on stage where the tiny glass figures sit. It is where Laura, the older sister who is “crippled” both physically and psychologically, fills her days endlessly “taking care of” her collection of miniature glass animals. It may sound petty and unnecessary to a new interpretation, but the shelves are not simply a corny reference to the title; they embody the conceit of her obsession. A few glass figures scattered across her brother’s desk do not for me an obsession make. This was all the more true as Keira Keeley’s portrayal of Laura Wingfield often left her hanging around the stage with awkwardness that appeared more a function of an actress lacking direction than a young woman who is pathologically shy and unsocialized. A classic production of “Menagerie,” as laid out by Williams, was elaborate and technically creative for its time (1944). Not only were shafts of light used to focus attention, but walls were made transparent through changes in lighting. Periodically there would be a projection of phrases — he called them “legends” — above the stage. He was fascinated and heavily influenced by the world of movies. The Wingfield family’s cramped and dreary apartment would be laid out fairly explicitly; the set would include glimpses of the alleyway it faced and the fire escape “terrace.” According to the program, Edelstein has set this production in a combination of a faded New Orleans hotel room and a tenement in St. Louis. However, the total comes across as a faded hotel room. It makes no sense if you have not first read the setting in the program; it is terribly uninteresting to watch for two and a half hours. All in all, the set has the look of an earnest high school performance on a stage that is too large for the available props. Brother Tom Wingfield (Patch Darragh) is both the narrator and a central character. In his opening soliloquy he explains that this is a “memory play.” For this “Menagerie” Tom is sitting at a typewriter in the hotel room he escaped to. Throughout, his manuscript serves as the basis of his narration; it is the most effective imagery of the production. It anchors the well-known interpretation that Tom is Tennessee Williams, the disaffected son who fled the suffocation of his miserable southern home life, abandoning his disturbed sister in the process. Tom’s guilt for leaving his sister is something he cannot scour from his mind; Williams was tortured by his own sister’s having had a lobotomy after he left; he felt he could have prevented it from happening had he been there. Tom’s mother, Amanda Wingfield (Judith Ivey), is a master of suffocation. She is the mother you would hate to have or to be. Her love, and her fears, for her disabled daughter and adult son come out instead as tyrannical, incessant nagging. She lives in her own memory world based on her idealization of her southern girlhood, which she recites to her children, ad nauseam. In this self-focused world she is the belle of the ball who was destined to marry a wealthy planter but instead married a “telephone man who fell in love with long distance” and has long since abandoned his family. Her preoccupation with her fantasy has given her a deaf ear for her children. It is intended that Amanda’s pretences be silly, but rather than subtlety, Judith Ivey plays Amanda for big laughs. I found it trivializing. Ivey is a celebrated actress, but it did not come through until the last scene where the caricature portrayal turns into a crystallization of her pent-up anger and frustration. The fault (or genius, as others would have it) is in the direction. From the setting, to the tone, little in this production complements the script. The pace was established by an excruciating pause at the beginning as Tom fumbles around his hotel room, finally typing on an old manual typewriter; unless you were sitting strategically, parts of his opening soliloquy are a strain to hear. The sitcom approach produced belly laughs trammeling Williams’s well-turned language; the opening night audience performed like a laugh track. If beauty is in the eyes of the beholder, these eyes did not find it. Oh well, chacun à son goût.